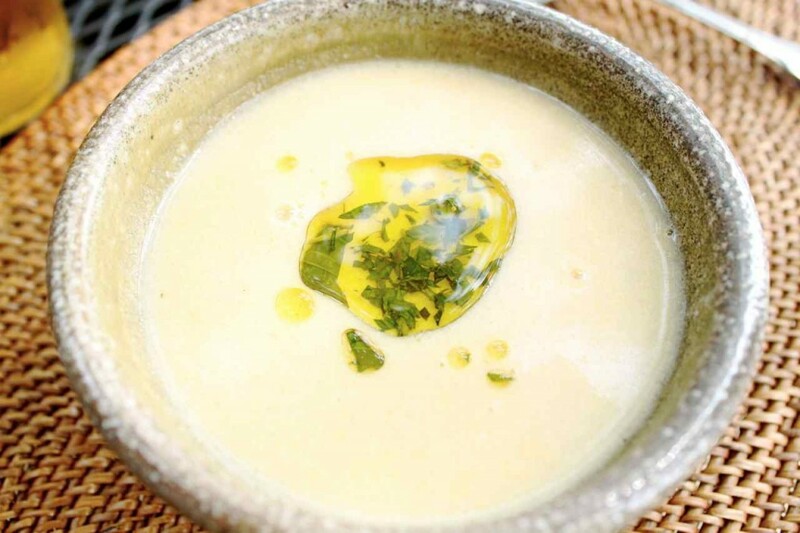 A rich, smooth soup that is lightly balanced with the tang of garlic and cilantro. Fresh corn and a little effort produce a show stopper soup packed with flavour. 1) Roast corn on a rack over high heat, turning occasionally with tongs until kernels are charred in spots, 4-5 minutes. When cool enough to handle, cut kernels from corn cob. Cut cob into thirds. 2) Bring kernels, cob pieces, 4 cups of water, garlic, ½ tsp. Garlic & Cilantro Corn Fiesta Seasoning, salt and ½ cup onion to a boil in a 3-quart saucepan and boil until liquid is reduced to about 3 cups – 20 minutes. Remove from heat, cool uncovered. Discard cob pieces. 3) Puree corn mixture along with the chile, ¾ cup remaining onion in blender, then pour through a fine mesh into a bowl, pressing hard and discarding solids. Return broth to cleaned blender. 4) Quarter, pit and peel 1 avocado, then add to blender with 2 tbsp. lime juice, ½ tsp. Garlic & Cilantro Corn Fiesta Seasoning and puree until smooth. Transfer soup to a bowl and cover surface with plastic wrap. Chill at least one hour. 6) Assemble Soup: Halve and pit remaining avocado and scoop small balls from flesh with melon-ball cutter, then toss gently with remaining tablespoon of lime juice in a bowl. Add 2 tbsp. water to sour cream and mix well. Season soup with salt and ladle into 6 shallow soup bowls. Divide avocado balls among bowls, drizzle with sour cream and Cilantro Oil.